A recent open access paper from the BioBE Center at University of Oregon explored the differences between airborne bacteria collected in parks and parking lots. Entitled “Urban greenness influences airborne bacterial community composition” and published in Science of the Total Environment, this interdisciplinary study combined research methods from microbiology and landscape architecture to answer the question: are airborne microbes a plausible mechanism through which health benefits from green space may accrue? 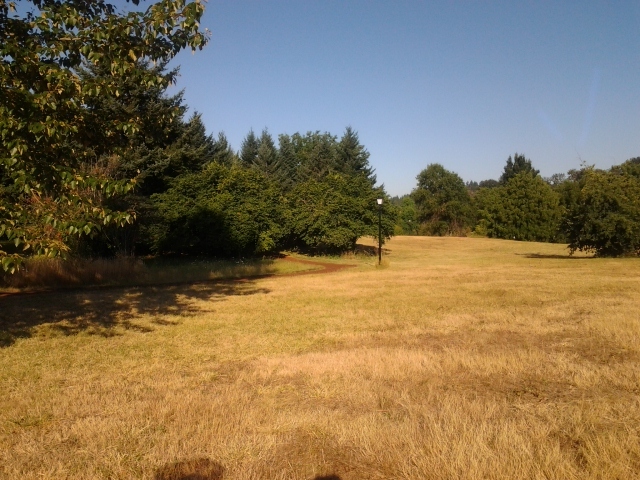 View from sampling site in Alton Baker Park, Eugene, OR. The authors hope that answering this question and identifying how vegetation affects the nearby airborne microbial communities will help landscape architects and urban planners to better design urban green space in future cities. This work follows in the footsteps of Frederick Law Olmsted, designer of Central Park and proponent of public health in early 20th century industrializing cities, and is bolstered by other recent work on vegetation and airborne microbes, notably “Contribution of vegetation to the microbial composition of nearby outdoor air” by Lymperopoulou et al. Gwynne Mhuireach is a PhD candidate at the University of Oregon in the Department of Landscape Architecture.